If you live for the corners, the Eibach PRO-PLUS Performance Handling Package delivers. 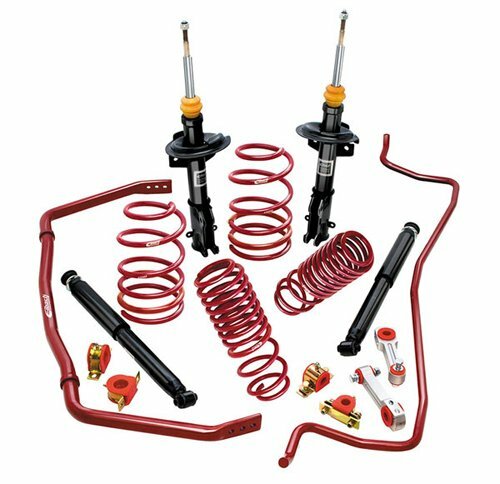 Eibach PRO-PLUS packages include our legendary Eibach PRO-KIT springs along with matching ANTI-ROLL-KIT sway bars. The Eibach PRO-KIT lowers your car's center of gravity, reducing squat during acceleration, body roll in corners and excessive nose-dive under braking. Add the Eibach ANTI-ROLL-KIT sway barswith increased roll stiffness, compared to stock barsand you get pure, balanced-handling perfection. With the Eibach PRO-PLUS installed you will immediately experience more-precise turn-in response, improved handling, and enhanced cornering gripin any performance-driving situation. The Eibach PRO-PLUS is designed and tested to work well with either factory or aftermarket performance dampers. * Your results may vary. As we have learned from racing and independent testing, lowering your car or truck's ride height also improves your aerodynamic effi ciency by forcing more air over the car and less underneath (where most of the drag is found on any vehicle), resulting in higher top speeds on the track and better MPG on the highway. 2002 to 2008 AUDI A4 Quattro Sedan B6/B7 4 Cyl. Comments: Front Sway Bar is Solid and Non-Adjustable/ Rear Sway Bar is Solid and 2 Way-Adjustable.